Do your days fly by? Is it difficult to make time for a trip to the gym? 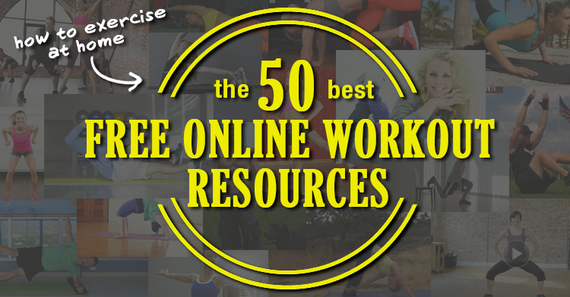 These are the 50 best resources for free online workouts that make is easy for you to exercise at home. Whether you have just a few minutes for a quick core workout, or if you'd like to join a month-long daily yoga challenge, there is something in here for you. I'm a professional weight loss coach and was chosen as "Canada's Top Fitness Professional." Each of my workouts found at makeyourbodywork.com will challenge your entire body and will include elements of cardio, strength, and core conditioning. The uniqueness of these workouts are the "difficulty levels" that provide up to four distinct options for every single move. This makes each workout very accessible for newbies, yet challenging for super-fit users. Jessica Smith TV shares a unique collection of videos with 7-minute, 10-minute and 30-minute workouts. She offers a really great variety of workout styles -- some focus on fat burning, others on cardio conditioning, workouts for beginners, kickboxing workouts and more. Jessica is an energetic instructor that will motivate you to join her. Spark People shares short videos for all different types of workouts. There are several categories -- Abs, Cardio, Yoga and Pilates, as well as others that diver into healthy cooking and eating ideas. These workouts are great when you are pinched for time. Choose a 10-12 minute routine and squeeze in some activity where you normally would have skipped it altogether. Enjoy doing yoga workouts with your favorite trainers such as Jillian Michaels, Jane Fonda, Billy Blanks Jr., Tara Stiles and many others. This channel might offer the best variety of any out there -- It even includes meditations with Deepak Chopra (maybe a good way to relax AFTER your workout). Livestrong Woman is a video channel featuring professional fitness instructor Natalie Jill. In addition to Natalie's resistance training instructional videos, you will also find great yoga beginners videos taught by Tara Stiles. As an extra bonus, this channel also includes some great videos that discus healthy eating tips and recipes. Anyone looking for yoga, Pilates, and gentle muscle strengthening workouts will love eFit30. These full-length (e.g., 20- to 40-minute) classes are perfect for days when you want to be active but don't feel like making the trip to your gym. Sarah is a well-known health and fitness blogger and has made "enabling your passion for healthy living" her mission. She shares a lot of quick and simple core workouts, cardio routines, flexibility workouts, and more on her blog. Sarah is fun, energetic, and really likeable, which makes following along with her workouts quite easy. Cassey Ho is the energetic fitness instructor behind Blogilates. She shares a lot of videos with quick and fun bodyweight workouts that you can do at home in just a few minutes. Her workouts are themed for different objectives such as the "Swimsuit Slim-Down" series that you can see below. Bodyrock.tv is one of the forerunners in online fitness. This popular health and exercise blog is dedicated to weight loss, fitness, beauty, food, love and relationships. "Bodyrockers" find daily workouts that are either laid out with descriptions and pictures, or that are instructed in video format. All of the workouts can be done at home with minimal equipment. GymRa offers a excellent range of video workouts that are divided into different categories -- 5- to 15-minute workouts for beginners, abs workouts, dumbbell workouts, no-equipment workouts, total body routines and yoga sessions. There is really something for everyone at Gymra. Workouts provided on the Live Strong YouTube video channel will definitely help you improve your strength, flexibility and fitness. Celebrity trainer Nicky Holender instructs most of the workouts you'll find here. He knows his stuff and tailors these workouts for busy people who want a quick exercise fix. Caroline Jordan Fitness is a great choice for quick core, flexibility, strength, and yoga videos. Caroline's demonstrations are excellent and her instructions of each more are very clear. This is a good place to learn the basics of some foundational workout moves. Enjoy doing easy step aerobics and fitness cardio workouts led by super-stepper Jenny Ford. Jenny does a great job of making step classes doable for beginners (like me) who might not be the most co-ordinated! You can certainly tell she loves what she does -- check out one of her free video classes. Amanda Russell is a former Olympic-hopeful runner who suffered a career-ending injury before she got to compete at the world's biggest stage. Now she has devoted her career to helping others safely stay in shape with workouts that can be done at home. Tara Stiles is a yoga guru whose video classes will help you become strong, energized, and more flexible at the same time. Tara's unique movement system is approachable for anyone. Be sure to try her 7-minute morning yoga routine (below) -- it's fantastic! Enjoy using Cosmo Body's videos that include easy-to-follow full-length strength, dance, and cardio workouts. Astrid Swan, celebrity personal trainer, also provides many quickie workouts (10 minutes and less) that give you an express option when you're crunched for time. XHIT has put together an impressive library of video workouts that are free to use on their blog or Youtube Channel. Their followers, called "X-hitters," enjoy the efficiency of their workouts (always under 20 minutes), as well as their exercise-specific instructional videos that teach just one or two moves in greater detail. Movee is the place to go if you're looking for quick, dance-based workouts that will get you sweating. It also provides videos with yoga workouts for beginners, pilates workouts for beginners, perfect leg workouts, easy back exercises, body stretches and amazing healthy raw food recipes. PsycheTruth is a holistic health channel on Youtube that discusses exercise, weight-loss, massage, pain relief, and many other health-related topics. Included are some amazing yoga sequences including this "10 days of flexibility" series that is worth checking out. Do You Yoga offers amazing yoga video "challenges" for everybody. Providing a little more structure via their courses (a number of which are completely free), Do You Yoga can help you create a habit of daily yoga! Method Yoga explains their approach best: "Method Yoga offers the student a processes of development and transformation by uniting methodologies of old and new so one begins to experience true liberation, wholeness and actualization which is the definition and purpose of yoga." It's hard to pass on that! Upside-Down Pilates shares videos that will help you realize the many health benefits of Pilates. These aren't "let's get sweaty" types of workout -- instead, they are more suited for improving the way your body moves by training your pelvis, hips, knees, arms and shoulders for proper function. Amber Karnes offers "judgment-free" yoga classes that are perfect for beginners and for those with "big bodies" who might not feel comfortable with traditional yoga poses. Amber has used yoga to help her embrace her own body and she is an excellent teacher to help you do the same. Susan's Youtube channel has lots of workout instructional videos and tips, but none are better than her 30-Day Ab Challenge. These are quick but challenging core workouts that offer you something different each day for an entire month! My Free Yoga is pretty much exactly as it sounds -- it offers free yoga classes for you to enjoy! It is a little different than other yoga options on this list in that it is really a hub for yoga instructors to post their free yoga class videos. The video library is huge and you can search for classes that focus on your specific problem areas. For example, there is a category for those suffering from hip issues and another for those experiencing back pain. Coach Joshua Kozak is the trainer behind HASFit, which gets its name because "every Heart and Soul deserves to be Fit!" These workouts are based primarily in bodyweight training, so they are nice for at-home or when travelling. Coach Kozak has prepared some unique workouts such as one specifically for seniors and a series for teenage weight-loss. 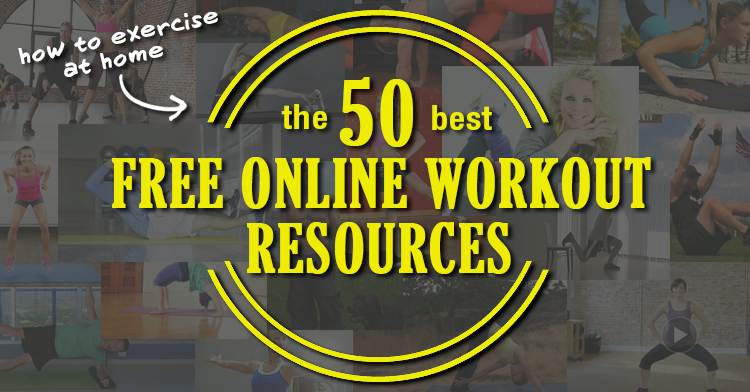 These 50 workout resources are some of the best you'll find anywhere online, but there might be others that deserve to be mentioned too. Tell us at Make Your Body Work and download this entire list of workout resources while you're there.